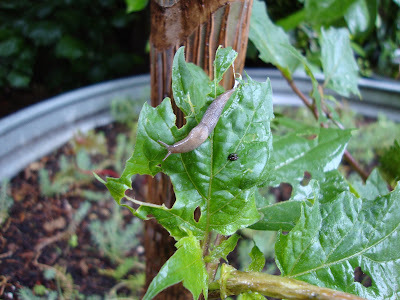 Needless to say the slugs are very happy with all the rain we've been getting. Earlier today, I picked a couple off an aloe, this one is dining on Datura leaves. Yesterday I found a couple of dead slugs floating in the Gunnera tank, they had drowned. Is it wrong to admit I smiled? Slugs are decimating the strangest things in my garden (sunflowers?) as well as the usual tasty stuff they always go for. No slug drownings so far, but earthworms are crawling across our paved surfaces in suicidal droves! linda, I wish I could do that. I just can't stand to see the insides of them. Matti, after I planted my first Hosta I went out in the night, convinced I would find it devoured and the little slimy buggers having a party on it's remains. Not the case. I've mellowed a bit since. Stephanie, do you have slugs in your garden? MulchMaid, the poor worms, we've had a few suicides too. regarding slugs, if you sprinkle salt on them, they shrivel up. like the witch, "i'm melting ...... i'm melting." question, that cilantro in the cans. are there holes in the bottom of the cans, or a handful of rocks?? It would be wrong to NOT admit you smiled. :) Evil, evil creatures. Why can't they eat dandelion leaves? BW Marie, as much as I love your Wizard of Oz comparison I just can't do the salt thing. It not only grosses me out but it just seems so mean! About the cilantro, I did punch holes in the bottom of the cans with a nail and I put a layer of chicken grit in the bottom too, to help with the drainage. Grace, Oh god...you're on to something! A slug genetically programed to eat dandelions! You would be rich.